If you missed them, check out the first 5 tips! 6. Pick the restaurant. “Where do you guys want to go?” “I don’t know, where do you guys want to go?” “Gee, I don’t know. Any ideas?” – Does this sound familiar? This is how it usually goes down when we try to pick a place to eat with friends. So instead of doing the back and forth banter, just pick. Pick the place you feel you can do the best. I cannot eat healthy at Cracker Barrel. Are there healthy choices there? Yes. I just can’t resist those blackberry pancakes. 7. Go for the protein. It’s going to happen. At some point you’re going to end up at a restaurant, cookout, or a theme park. We have season passes to Dollywood, but when I go – I panic. There is virtually nothing healthy there. Once I went and they told me they didn’t have salads that they were seasonal. What?! So go for the protein. If lean is available, go for that. Get protein and try to get some veggies with it. Once I had to settle for some kind of fajita at Dollywood – I ate the meat and cooked veggies and tossed the shell. Maybe not the best thing, but you do what you can when you’re in a pickle. 8. Pack. Yes, I have seriously brought my own food into a restaurant. We were at a teaching conference and all my friends wanted to eat out, but I had already packed my healthy lunch. Solution? I ate my packed lunch with them in the restaurant. I bring my own snacks to the movies. I packed up a cooler of food when we toured Biltmore. Pack your own dressing if you know you’re going to eat out and get a salad. That’s usually where restaurants get ya – on the salad dressing. 9. Personal Restaurant! Okay, this isn’t exactly eating out. This is more like avoiding a restaurant. Your friends want to have a nice evening together? Invite them over to dinner and then you are in charge of what goes on the table. Host a game night or a cookout. Have friends over for dinner and then head out to the movie or putt-putt. 10. Doggie bag it! Usually the servings at restaurants are very large. Ask for a box when you get the food – put half of your entrée in a box. If it’s on my plate, I’m going to eat it. If it’s not – I won’t. Otherwise - order the lunch portion. Split a meal with a friend. Don’t hate me, but you could order off the kids’ menu. You’re the customer – substitute for healthier options, ask questions about how it’s prepared. 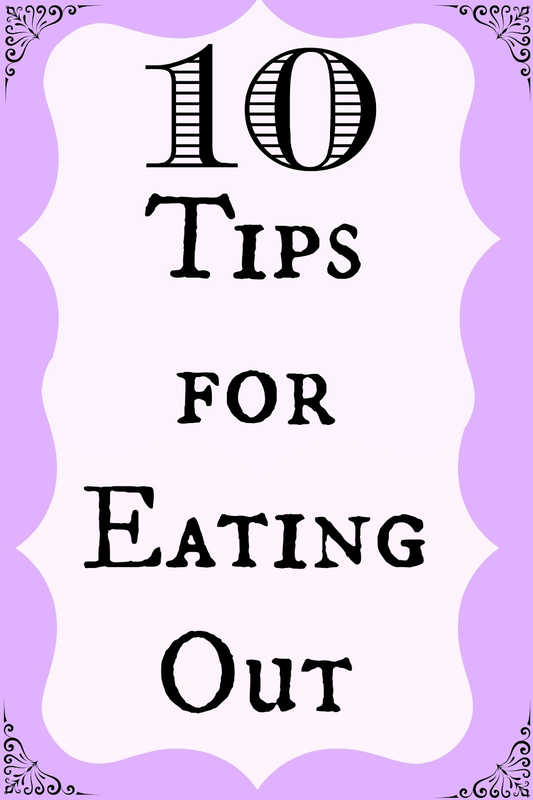 Do you have any other suggestions for eating out? Guidelines to follow? Favorite places to go?